How to split multiple page PDF into separate pages as PDF? I have a PDF which have multiple pages. Now I want to share some of the pages to my friends, rather than all pages. Because some PDF pages is confidential that cannot share to outside. Is there a way to split multiple page PDF into separate pages as PDF? It will be best if I can define the extract page range. I suggest you to use A-PDF split, this is a simple to use desktop application for you to split multiple page PDF into separate pages and save those pages as PDF format. The separate roles are varied. 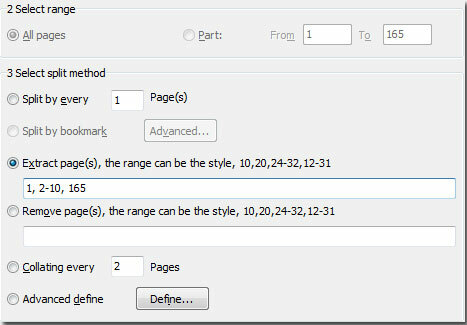 You can split PDF pages by specific page, for example: extract page 1, 2-3, 10. Or you can split PDF pages by the original bookmark from PDF. All the separate process is independent, without need to open Adobe Acrobat.